6. The Rock ‘n’ Roller Coaster Starring Aerosmith – Also found on the end of Sunset Boulevard is another very popular thrilling attraction that is housed inside a famous recording studio. The Rock ‘n’ Roller Coaster Starring Aerosmith bring guests into G Force Records where they just happen to bump into the band as they are finishing up a recording session. Guests find themselves invited to a concert across town and in need of a fast super stretch limo to get them there. After strapping in, the super stretch limos rocket into the darkness and neon lights of downtown, accelerating guests from zero to sixty in seconds! Once moving, guests can enjoy a rocking soundtrack courtesy of Aerosmith, several inversions, and some of the biggest thrills in all of Walt Disney World. 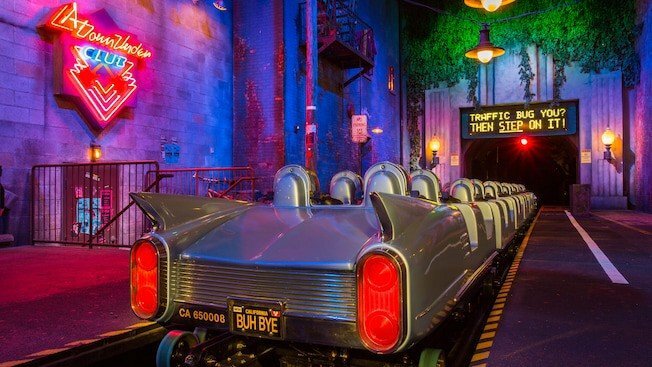 The Rock ‘n’ Roller Coaster Starring Aerosmith is an extremely popular attraction and those who want to avoid lengthy wait times should opt to book a FastPass for the experience or wait on the typically shorter Single Rider line.